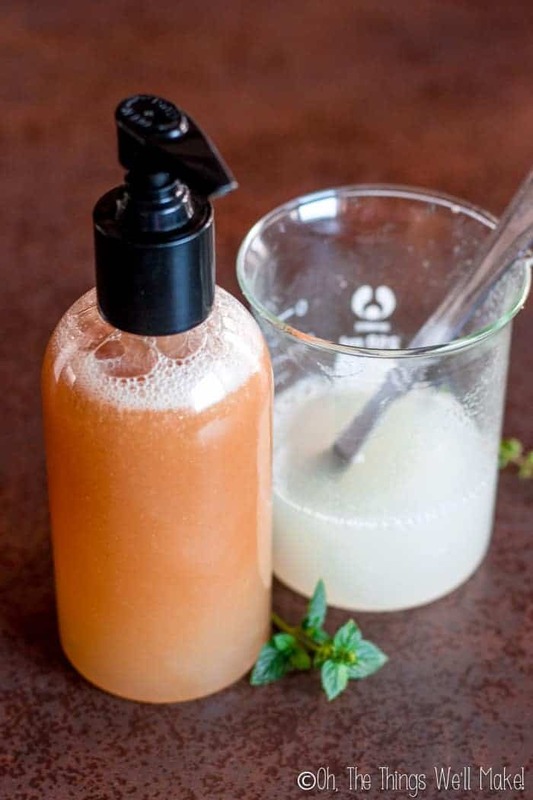 Natural DIY Clarifying Shampoo - Oh, The Things We'll Make! 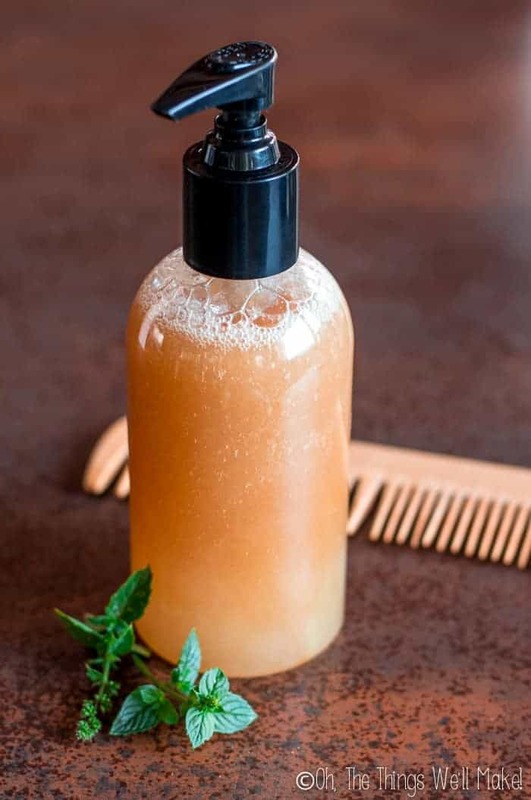 Cleanse your hair gently with this DIY clarifying shampoo that uses natural surfactants to remove dirt and leave your hair clean and soft. 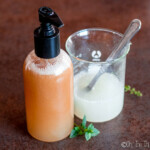 Because many of you have found me through my soap recipes (like my liquid Castile soap or my easy beginner soap), I often get requests for a soap-based shampoo. While I love making soap, I never use soap for my hair because it leaves my hair dry and unmanageable. Some people are able to cleanse their hair with Castile soap and are quite happy with it, but I'm not one of those people. Why not use liquid Castile soap? I'm not alone, though. Castile soap isn't an ideal shampoo for hair because the pH of soap is high yet our hair and scalp have a more acidic pH. Not only can an alkaline shampoo increase the negative charge in the hair making the hair more prone to friction and damage, but it can also be irritating to your scalp. 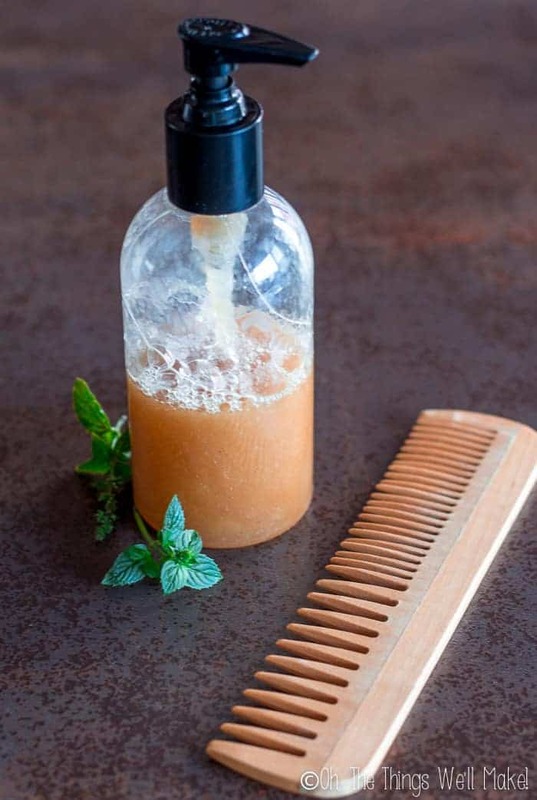 In an attempt to remedy this issue, most people who wash their hair with soap or soap-based “shampoos” will follow it up with a vinegar rinse to lower the pH again. Not everybody reacts well to vinegar rinses either. I, again, am one of those people and I don't like the feel of my hair after a vinegar rinse. You want a “natural” alternative, but soap may not be the best option. So what's left? I'm actually not even an SLS hater, to be honest. (Shocked?) I use it in my homemade version of Dr. Bronner's Sal Suds just like they do (I'll share my recipe soon! ), but I reserve it for general cleaning around the house. For my skin and hair, I choose milder, more natural surfactants instead! Who is this shampoo best for? Because this is a fairly gentle shampoo, it should work well with most, if not all, hair types. Those who follow the curly girl method for developing waves or curls and keeping their hair hydrated can use this shampoo as a “low poo” alternative. (No, I didn't come up with that term.) It makes a good starting point for beginning the process and for occasional washings when normally using co-wash.
Why make your own clarifying shampoo? It's very difficult these days to find shampoos free of harsher surfactants like SLS. When you make your own shampoo, you can control which surfactants you use. Many shampoos also have other ingredients that may not be right for your hair. They may contain non-water soluble silicones, harsh preservatives, and artificial fragrances. What it comes down to, though, is that when you make a product, you can control the ingredients and customize the recipe to suit your needs. While most of us aren't that in tune to our hair and will use just about any shampoo that doesn't have harmful ingredients, those that are doing processes like the curly girl method to maintain perfectly hydrated curls and waves are often very in tune to what their hair needs in terms of vitamins and proteins. Your hair may show more need for protein, for example, so you can adjust the amount you add to your hair care products. Looking for a shampoo without protein, you can make it without too! 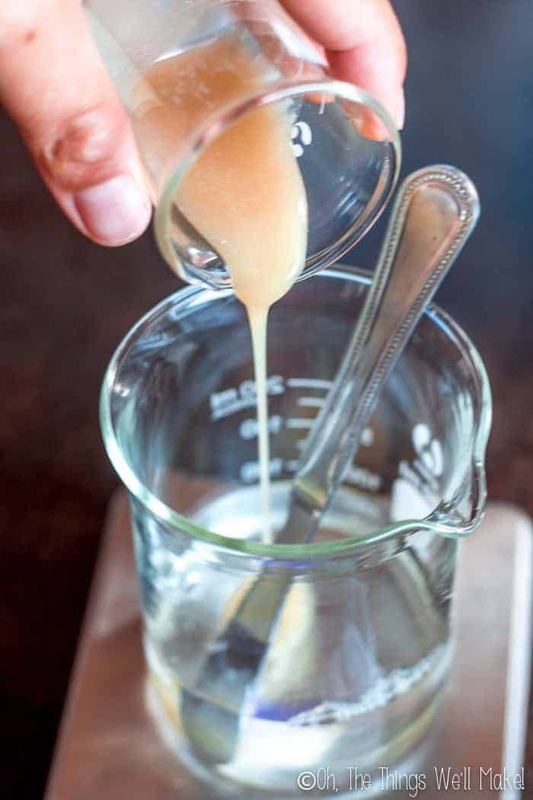 Making your own shampoo allows you to fine tune it to perfectly suit your hair from batch to batch. In the shampoo in the photos, I actually used an infusion of peppermint leaves in distilled water as the water component of the recipe. I like mint for shampoos because it leaves your scalp feeling nice and refreshed, and just feels clean to me. That refreshing feeling is said to help stimulate the circulation in the scalp and may help stimulate hair growth. In this photo, you can see the difference in color between making the recipe as-is with distilled water vs. making it with an infusion. Prefer to use a floral water or some other infusion? Go for it. It's your shampoo. Nettle tea would also make a good base as nettle is also said to be great to help fight hair loss. 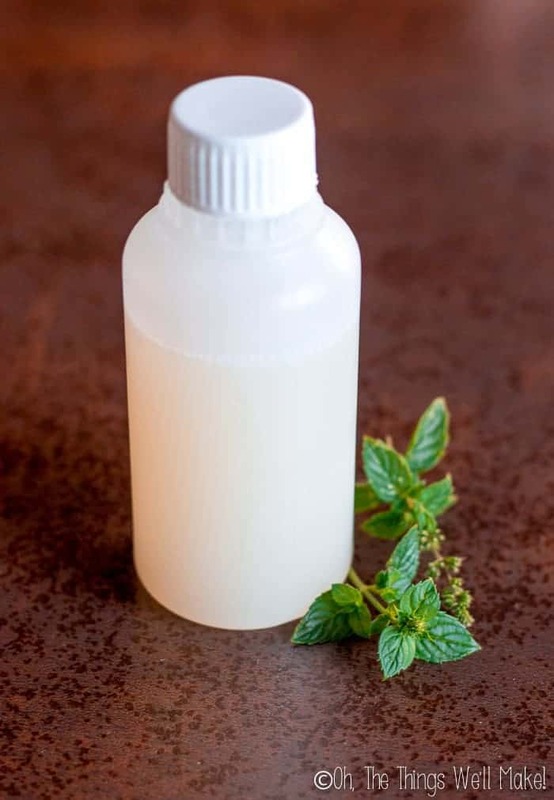 You could have the best of both worlds by using a nettle infusion and some peppermint essential oils. You can experiment by changing up some of the surfactants in this shampoo. I used a mix of non-ionic surfactants (coco glucoside and decyl glucoside) as well as an amphoteric surfactant (coco betaine) to help boost the foaming. Because my husband likes a lot of lather to his shampoo, and I'm not using any of the harsher anionic surfactants like SLS, I'm using a relatively high percentage of surfactants in this recipe. You can reduce the percentage of surfactants added to make for an even gentler shampoo, but you will probably find that it will also lather a bit less. This shampoo was made with distilled water so it's lighter in color. 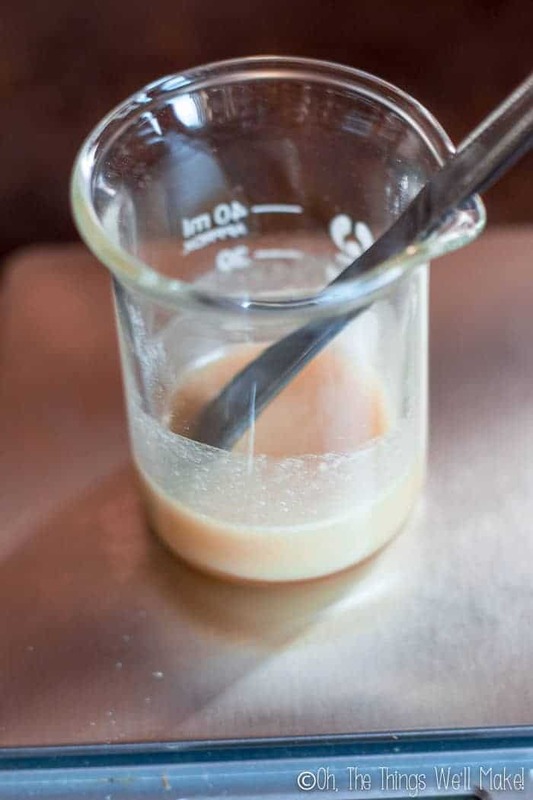 Mix together the glycerin and xanthan gum until the xanthan gum is fully incorporated into the glycerin. 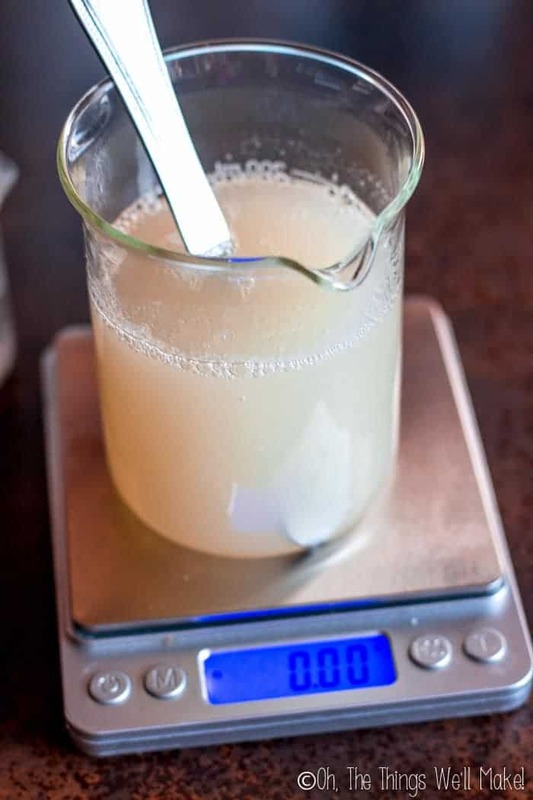 Pre-mixing the xanthan gum into the glycerin will help ensure that you don't get lumps in your shampoo as xanthan gum can be tricky to mix into water. Once you've incorporated the xanthan gum into the glycerin, you can begin to add the other ingredients. Slowly stir in each ingredient keeping in mind that vigorous stirring can cause foam production, making it more difficult to work with the shampoo. Once you've finished mixing together all of the ingredients, check the pH of the shampoo with a pH test strip. You want your shampoo to fall in a slightly acidic range. (A pH of 4-5.5 is an ideal range to aim for.) You also want to make sure that the pH is suitable for the preservative that you are using. If you need to adjust the pH, you can bring it down with the addition of a few drops of lactic acid or can raise the pH with either baking soda or sodium hydroxide (aka. lye). Otherwise, you are ready to bottle and use your natural homemade clarifying shampoo. Thanks for the information. I’ve been using some of the recipes you discourage. I found them through quick searches on the web. Good to see this. My question… I was trying to determine what the approximate cost would be but I’m having a hard time. Most of the ingredients online are measured in oz/ml rather than weight and your recipe uses grams. How can I figure the cost before buying the ingredients. It appears what I’ve found will likely cost me $100 which is fine IF it makes a lot of shampoo. Thanks for any help you can provide. Can you link to an example for me- maybe I can help you out better if I see which ones you are looking at. Sorry for the delay… was watching for this in my email inbox. I guess it really depends on how inexpensively you can buy the different surfactants where you live. On the one hand, a shampoo bar is almost completely comprised of surfactants, so it may be a bit more expensive to make, but it may also last longer. I’m not sure. My guess is it works out to about the same. It will be soon, though. I think I have one DIY and one recipe due to be posted first. Ok I’ve found all the ingredients that you list online but I can’t find the Coco Glucoside anywhere so far. (I live in the US) Could I adjust the amounts and just do without it? Would it still work good? So my query is can we create a shampoo recipe with the liquid soap (combination of coconut , castor , olive oil ,koh) ,from my understanding is an anionic surfactant and an amphoteric surfactant . If so will the addition of amphoteric surfactant reduce the ph and harshness of liquid soap making is suitable for our hair wash. The problem with soap (And, yes, you are right about it being an anionic surfactant) is that it breaks down when you bring down its pH. It’s unlike the other non-soap surfactants. Some people try to bring liquid soaps down towards a neutral pH, but soap doesn’t hold up even at a neutral pH. The ideal pH for a shampoo is on the acidic side (around 5.5). Even if you’d combine with an amphoteric surfactant, you’d have to bring the pH down afterward, which would leave you with something that I doubt would be very effective anymore. Hi Tracy ! If I wanted to add something like Shea butter, what emulsifier do you recommend? I don’t normally add oils to shampoos because it really cuts down the lathering ability of the surfactants (and natural surfactants tend to have less lather to begin with). Shampoo bars are an exception, and I’ll be sharing a recipe for a homemade shampoo bar soon. Hallo Tracy, what a wonderful recipe! I made it and I am delighted with the result. My hair feels very good, much better than with other “natural” things I tried. This time I used lavender hydrosol, and some essential oil of patchouli and geranium. It is nice to try different ingredients at different times and see what effect it has on the hair. Great, I am looking forwards to more recipes of you. Thanks a lot! I’m so happy that it worked for you. I hope to give you many more very soon! Fantastic, this recipe sounds amazing! May I just ask what works as am emulsifier in this recipe? For the essential oils to mix with the water base? You aren’t using very much oil, so the surfactants themselves are enough to keep the oils incorporated into the mixture. Hello! Looking forward to trying this (and your conditioner) soon! I’m working on accumulating the ingredients I don’t have yet. Coco glucoside is the trickiest to find, though I can also only find one place that sources coco-betaine. Are there any substitutions that could work for either of those? Thank you! Well, you can try some of the other natural surfactants that I list in my guide to natural surfactants, but keep in mind that they are all slightly different. So, if you use a different one, it may change the way the shampoo feels, cleans, etc. I like testing my recipes out for several batches before posting them on my blog. In this case, I really like this combination. That doesn’t mean another combination won’t work, though. Keep in mind, that once you buy for shampoo, you can use for all sorts of other things too- like body washes, facial washes, cleaning around the house, etc. Little by little, I’ll be posting more recipes using these surfactants, so you can use them for more than just this recipe. Aah, thank you. That is helpful on both fronts – referring me to your blog about surfactants, as well as reminder that they can be used in other products. Your link to coco-betaine is the only brand I’ve found so far, but on the manufacturer’s website they list it as cocamidopropyl betaine (https://www.makingcosmetics.com/Coco-Betaine_p_273.html)… so I’m on the hunt for another brand. Crazy how hard it is to find in the US! Thanks again for the recipe. I added more distilled water in mine. My sons agreed to test it for me. Next time I will try with the infused moringa tea. I hope they (and you) enjoy it! Merry Christmas too! I did, I used liquid germall plus. Hmmm I wonder why you weren’t able to tag me. It should be fine, then. I believe coco betain should be reduced if you completely want to be organic although many people are unaware. Just a thought. Tracy, could this also be used as a body wash? If not, could there be some minor additions or subtractions to turn it into a body wash? I’m totally new to formulating and have read that shampoos can be used for body washes, but not the other way around. Your skin is a lot more resilient to those sorts of things. I can use soap well for body, but my hair hates it! I’ll be posting some body washes in the (hopefully) near future– just trying to get caught up on getting my new posts out on the blog! The holidays are a busy season. Legally, I can’t sell homemade products here in Spain. I could, but I’d have to make them in a local outside of my house and do a lot of paperwork to be able to do so. Then, it would have to follow European regulations, meaning I’d need to pay for microbial testing, etc. I’d also need some sort of insurance.